The Power Your Business Summit will not only address but answer many common business problems and challenges that are actually fixable. Topics covered are a pain point for every business no matter your size and will give you the edge to stand out in a noisy market. Whatever your business; NOW is the time to Power Your Business. This is a one day business accelerator event and education platform supported by access to some of Australia’s leading business growth experts. Learn proven business growth strategies and action tools (plus receive the EXCLUSIVE and only available to attendees Power Your Business Growth Manual from the people behind the success of Australia's leading businesses. There will be no bait and switch at during the presentations. We're offering 100% value and no selling or pitching to our attendees. We believe in no fluff and 100% strategic implementation for all of our attendees. 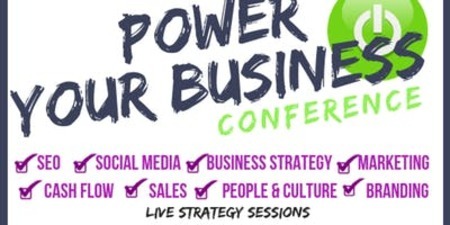 This event is designed to put directly in your hands key strategies from our experts for any business owner / sales professional / marketing team and so forth. This is not a conference that will have pitches of sales to you just leaders in their fields providing workshops and their success secrets to you in a setting of education and improvement networked with other driven professional peers. All attendee's will receive an as an attendee the PYB Business Power Manual to use during the workshops with each presentation and as a take away to reference guide to refer back to time and time again.